This morning we got up and took the Tube to Westminster, where we toured Westminster Abbey. I would have to possess the combined talent of all the poets memorialized there in Poets Corner to even try to describe the abbey. 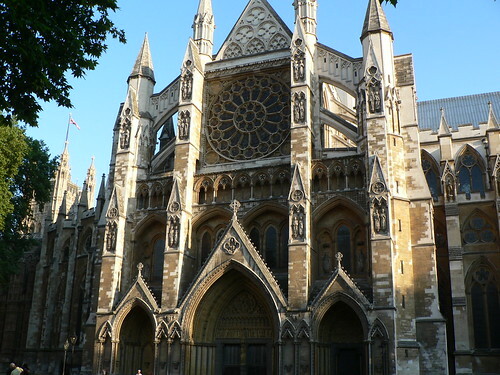 It’s over 1,000 years old and every king and queen of England from William the Conqueror on–38 in all (two kings were not coronated ceremonially)–has been crowned in the same spot in Westminster Abbey. Many state funerals have been held there as well, such as Queen Elizabeth II’s mother and Princess Diana. Heavy historical stuff. It was like St. George’s Chapel at Windsor magnified many times over. Tons of kings and queens and prime ministers, and many other famous people, are buried there. It’s got to be the most ornate place on the planet. The high, vaulted ceilings are like nothing I could ever have imagined. We got the audio tour guides to help us along, and went around the place in about 2 1/2 hours. It was so cool to see the place where 38 of England’s kings and queens have been crowned, even William I! We saw the tombs (I’m sure I’ll forget some) of: Edward I (1239-1307), Henry III (1207-1272–he spent the equivalent of 17 million pounds, roughly $30 million, on the abbey), Elizabeth I (this was amazing! ), Mary I (buried next to Elizabeth–ironic considering their disputes during life), Oliver Cromwell (at least he was buried there for two years before being dug up to be hanged and decapitated), Queen Anne Nevill (wife of Richard III, daughter of the “Kingmaker” Richard, Earl of Warwick; her dates were 1456-1485), poets Geoffrey Chaucer and John Dryden, composer Handel, 19th-century missionary David Livingstone, Isaac Newton (who had a big monument), James I (no monument–just barely marked with a small black slab–not sure why), and Charles Darwin, who also had a big monument near Newton’s. Wow! 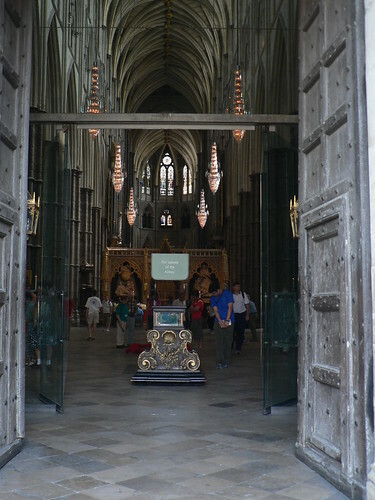 You’re not allowed to take pictures inside Westminster Abbey. So when we got outside, Carolyn turned around and took the above picture of the inside, but she was technically outside! If you look closely, you can see a monument to Isaac Newton on the left and one to Charles Darwin on the right. The effigies on the tombs of Elizabeth I and Henry VII were made from death masks, so it’s actually what they looked like! We also saw effigies for many other monarchs in the museum there. By the way, William I was crowned there on December 25, 1066. Near the former tomb of Cromwell, there was a hole still in the wall from the German bombing raids of World War II. It is now covered with glass. Another really cool thing was a coronation chair first used by Edward I in 1308–and used to seat every monarch since as they are crowned! It’s a 700-year-old wooden throne, scratched up from years of not being protected from the public. We visited a very old cloister used by the monks at the abbey until 1559, when Henry VIII terrorized the clergy. We saw the monks’ chapter house, used until Henry VIII took it. 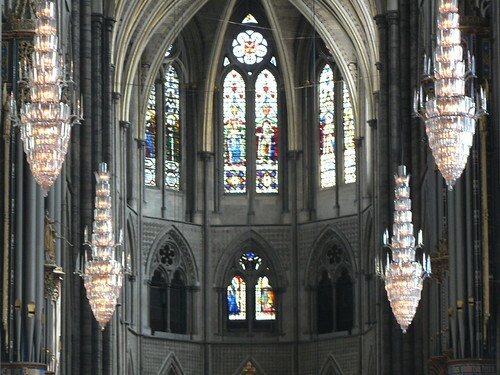 Its stained glass windows were destroyed by the Nazi bombs of WWII, but have since been replaced. The ancient floor is original, as are the remnants of old paintings along the circular wall. The entrance to the Pyx chamber has a heavy oak door from 1090! The room was used to store royal treasures and state documents. The museum there said that a church has been on the site of Westminster Abbey since as far back as at least the 8th century! Amazingly, the museum contained a 4th-century, Christian, Romano-British sarcophagus, still in very good shape considering its age. It has a cross carved on the top. There were also fragments of some Roman thing dating from the 1st to 4th century A.D., complete with the official Roman stamp. The museum also had many ornamental and symbolic items used in coronations throughout the centuries. Outside these rooms were more grave markers, including one for 26 monks who died of the “Black Death” in 1348. Near the exit, there hung an American Congressional Medal of Honor, commemorating an unidentified British soldier, killed in World War I, whose remains are buried there. After leaving Westminster Abbey, we ate a quick lunch at a cafe nearby, toward the cathedral, called Ponti’s. I had an excellent tuna and cheese sandwich, one of the best I’ve ever had. We traded in some travelers checks for pounds and Euro, then made a mad dash for Madame Tussaud’s famous wax museum, taking the Tube there. Unfortunately, there was a very long line there and we were pressed for time because we wanted to make it to tea, so we weren’t able to visit the museum. 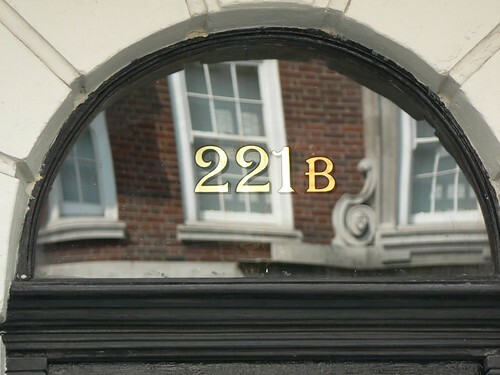 Instead we walked up Baker Street and took a picture of a door at 221B, the fictitious residence of Arthur Conan Doyle’s famous detective, Sherlock Holmes. 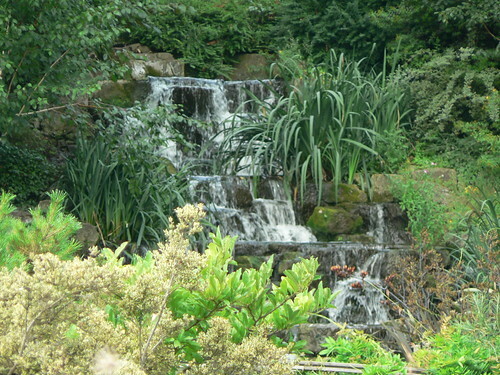 Then we visited nearby Regent’s Park, which was great. Again it was land seized by Henry VIII, who turned it into hunting grounds. A century later the woods there were cleared to pay for troops. Now it’s a really beautiful park, the kind you’d only find in England: beautiful, beautiful, remarkably beautiful flower arrangements–especially roses of every kind imaginable and then some–all over the place. There were spacious green lawns, walking bridges to smaller gardens with waterfalls, meandering walkways, a stream with people rowing slowly through the park, a variety of ducks and other birds, and big fancy gates. Carolyn really enjoyed this park and took a lot of pictures of flowers. Then we looked at a map and discovered that Abbey Road, the famous namesake of the Beatles’ album, was nearby. 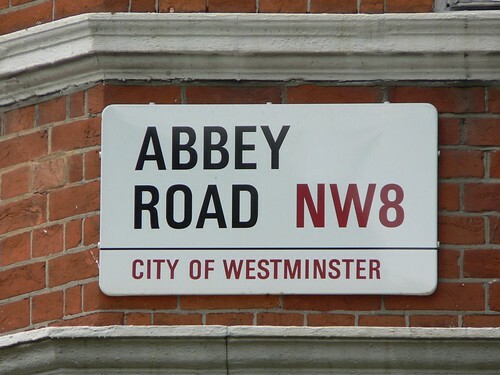 Actually, the road we’re staying on, Belsize Road, intersects Abbey Road and is not far from the site where the picture on the cover of Abbey Road was taken! 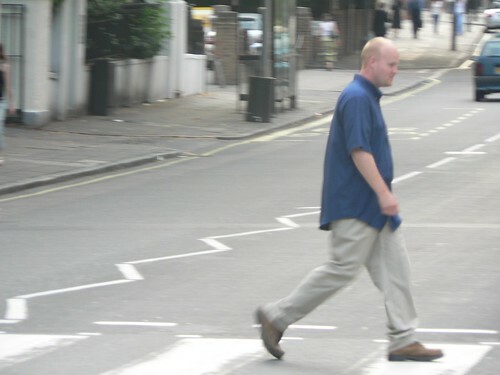 Carolyn got a couple pictures of me strutting across the same famous crosswalk which the Beatles crossed on the album cover. She was so embarrassed, but I couldn’t pass up the opportunity! We went to the nearest Tube station, St. John’s Wood, and bought Abbey Road souvenirs for Christopher and Dylan. Then we hustled over to the Tube at Harrod’s, the famous store near the Knightsbridge station. We went to the second-from-the-top floor (the 4th, I think) and went to the Georgian Restaurant (or something like that) for a traditional English tea. This was very high on Carolyn’s list of things to do in England! So we enjoyed a nice tea with the weird accompanying dainty stuff. It was nice, but I’m afraid it wasn’t as elegant as she was hoping for. 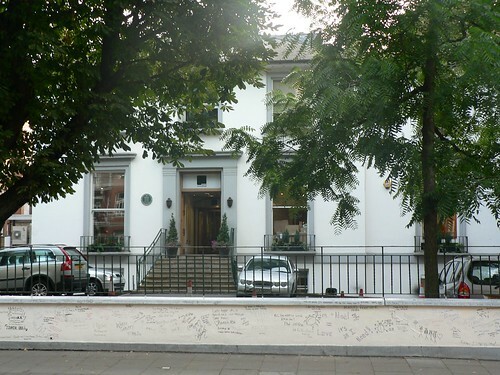 We went up to Abbey Road again and followed it up to Belsize, where we returned to our room. 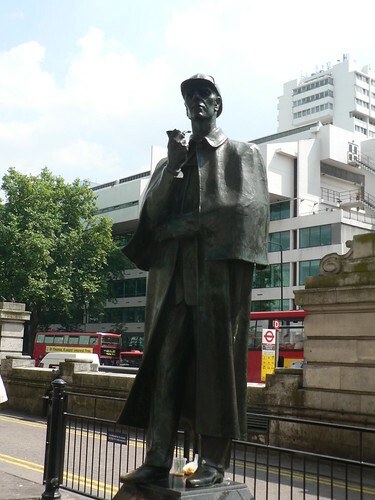 First I went up the street to the Swiss Cottage Tube station to check on departure times for tomorrow morning. They don’t start in time for us to catch our 5:30 a.m. ride across the Chunnel, so our hosts–Arnold & Monica–called for a cab to pick us up at 4:30 a.m.
hahaha….They’re British, what can I say. They even drive on the wrong side of the road, so what can we expect? Actually, I hadn’t even noticed that until you pointed it out. Very observant! Wow a building that has existed since begining of the 2nd millenia. That must have been something! It definitely was. Most stunning man-made thing I ever saw. It still blows my mind that on back-to-back days I was able to tour Westminster Abbey in London and Notre Dame Cathedral in Paris… as you’ll read about next week.